Europe's biggest cheerleader for austerity is heading to the polls, and its stance on Greece threatens to catalyse a break-up of the union. Finland is the unlikely stage for the latest turn in Greece’s interminable debt drama this weekend. With events having decamped temporarily to Washington DC, Athens will be keeping half an eye on developments in Helsinki, where the Nordic state of just 5.4m people heads for the polls on Sunday. In the five years since Greece’s financial woes were revealed to the world, it has been sleepy Finland which has emerged as the most trenchant critic of EU largesse to the indebted Mediterranean. The outcome of the country’s general election could now determine Greece’s future in the monetary union. In a leaked memo seen last month, it was revealed that the Finns had already drawn up contingency plans for a Greek exit from the euro. Although ostensibly a sensible measure for any finance ministry to contemplate, the document confirmed the Finns' position as the most uncompromising of the EU’s creditor nations. The reputation is well-deserved. At the height of Greece’s bail-out drama in 2011, Helsinki negotiated an unprecedented bilateral agreement with Athens, receiving €1bn in collateral in return for supporting a rescue deal. A year later, the Finns were prime candidates to become the first dissenters to voluntarily break the sanctity of monetary union. “We have to be prepared,” the country’s then foreign minister said three years ago. Greece's current impasse is also partly a result of Finnish obstinacy. Helsinki was one of the main obstacles to securing a longer extension to Greece's bail-out late last year. The eventual compromise of a three-month, rather than six-month reprieve, has seen the new Leftist regime scramble desperately for cash since February. With the situation in Athens deteriorating by the day, both Finland's prime minister and central bank governor have eschewed high-minded rhetoric about European unity, to insist creditors should be ready to pull the plug on Greece. But unlike its fellow creditor giant Germany, Finland is more economic laggard than European powerhouse. Having been mired in a three-year recession, the country heads to the polls with economic output still 5pc below its pre-crisis levels. 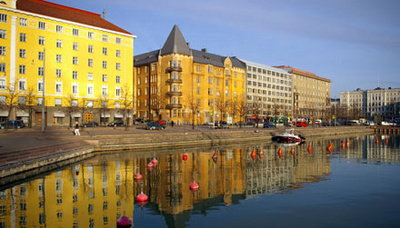 Finland has suffered an economic downturn of almost Greek proportions. The boon from falling oil prices and launch of Eurozone QE will still only see the economy expand at a paltry 0.8pc this year, worse only to Italy and Cyprus. Finland has struck a blow for genuine exceptionalism in Europe. Anti-NATO parties dominated polls while Eurosceptic cred was championed not only by the longstanding anti-EU party, but also, uniquely within the Eurozone, by the Social Democratic party. Depending on your perspective, Finland may conjure recollections anywhere from Sibelius’ exquisitely lyrical Karelia Suite to the speedy monosyllables of Formula One champion Kimi Raikkonen...via multiple thoughts in between. Nevertheless, it doesn’t link easily in the mind to the Mediterranean. Yet the new Finnish government may be about to make an indelible impact on the Eurozone’s profligate south. Let’s back up for a moment: the Finnish General Election campaign concluded at the weekend with a popular vote amongst the population of 5.5 million. Western media saw the Finnish vote as a very insignificant sideshow to the 2016 Clinton coronation (which probably won’t be...but that’s another story) or the current British bore fest of economic illiteracy. Yet the Finnish election of 2015 may have more ramifications for Europe than who governs either the UK or US in the near future. That’s not because the Finnish economy is rebounding fast - rather the backdrop to the vote was one with GDP still 5 percent below the previous peak. Nevertheless, the Finns aren’t profligate. Their debt to GDP is a modest 57 percent, vastly below even Germany (80 percent) or the UK (90 percent), and a fraction below the Mediterranean spendthrifts. Finnish unemployment is an uncomfortable 9 percent - true that is less than say France, but in Helsinki government retains pretensions to economic credibility which Paris has clearly long since abandoned. Even the last Finnish government, despite apparent pro-EU credentials, was sceptical about the retention of Greece in the Eurozone. When the Greeks passed around the begging bowl, the Finns, uniquely, demanded €1 billion in collateral from Athens in order to support the 2011 bailout. If anything, since then, Finnish opinions about the Mediterranean have become even less sympathetic. Reports continue to suggest it was a hardening of Finnish opinion which resulted in Syriza being forced to accept a three-month debt reprieve in late February. Ever since, Athens has been in a desperate struggle to meet its obligations and the noose continues to tighten, as the Greek nation struggles to accept that it is wilfully strangling itself within the single-currency straitjacket. Against this background, last Sunday’s Finnish general election may have appeared a largely local political event, but it is in fact another step towards the likely breakdown, or at least shrinkage, of the Eurozone. The winner of the election, ousting pro-NATO, pro-EU PM Alexander Stubb, was Juha Sipila, a millionaire executive in, perhaps appropriately for the nation of Nokia, the telecoms industry. The new PM-elect is expressly anti NATO membership as are three of the leading four parties in the election who together garnered more than 55 percent of the popular vote. That suggests recent NATO sabre rattling against folks to the east has not rung a chord with Finnish voters… However it is in the euro arena that matters perhaps look most fascinating. A strong second in the poll was ‘The Finns’ party, which dropped the ‘True’ epithet from its name this time around, but retains a very strong Eurosceptic tone. ‘The Finns’ are highly likely to form a key component of the government and their role as runner up party means they have the right to nominate the finance minister. While ‘the Finns’ toned down the rhetoric of previous campaigns this time around, the simple truth is that even a pro-EU PM was previously twisting the at every turn on the Greek economic meltdown. With Finland taking a clear turn towards euroskepticism, the euro endgame has taken an interesting new twist. Well, unless you are Greek, with citizens harbouring a curiously stubborn desire to retain the euro - despite that slight blurry attitude towards debt. Thus, events at the weekend mean resolution of the Greek’s stay-or-leave euro dilemma took a step towards eventual resolution. If you want to save time, you can safely ignore the breathless discussions as negotiations drag on through another cycle of emotive Greek drama in Riga this week. The Finnish elections have merely confirmed the fate of Athens’ futile endeavours to remain a fully ‘unpaid up’ debtor member of the flawed Eurozone. A right wing anti-EU party has enjoyed success in Finland’s election that saw the governing National Coalition suffer a dramatic defeat. After a campaign dominated by domestic issues, the opposition Centre party won 49 seats of the 200 up for election, while the anti-EU Finns Party won 38 and the governing National Coalition won 37. As a party of the populist right, the Finns latches on to voter discontent wherever it can be found. It did so spectacularly in the 2011 elections, where the party (previously known as the True Finns) expanded its vote share by an historic 14.9% vote share – the largest increase in parliamentary history. That success was largely attributed to the Finns' unashamedly anti-European integration platform, which distinguished them from all other major political parties in Finland. At the time, Eurozone bailouts were a critical issue in Finnish politics, and the bailout-seeking member-states were widely disparaged as fiscally irresponsible and reckless. The previous Finnish government drove a hard bargain at the EU bailout negotiations, insisting for example that an Irish bailout be accompanied by strict Irish financial policy reform. Finland’s European Commissioner at the time, Olli Rehn, was responsible for Economic and Monetary Affairs, and also proved a strict financial disciplinarian, earning the moniker “Rehn of Terror” among the bailout-seeking states. The Finns Party, however, promised an even tougher stance, and stood against devolving more financial authority from Helsinki to Brussels and the European Central Bank in Frankfurt. With its success in 2011, the Finns Party was well placed to enter the governing coalition, but leader Timo Soini preferred to remain in opposition. Joining the government could have undermined its dissenter appeal, and Soini rejected the idea that The Finns Party could join a coalition government that was willing to bailout Eurozone economies. This time around, though, Soini appears to have had a change of heart. He has clearly indicated his desire for The Finns to join a government, even though this would mean working with parties that voted for the bailouts. Soini is confident a compromise can be reached, but the risk of diluting his party’s key anti-European integration measure may cost it further electoral success. The Finns Party is also not the most appealing coalition partner, particularly for parties on the social left. Some of its MPs have expressed deeply controversial opinions about Muslim migrants, which attracted widespread condemnation. The party’s former Chairman of the Administrative Committee, Jussi Halla-Aho, was found guilty of ethnic agitation by the Finnish Supreme Court in 2012. From 2003 to 2011, the Centre party held power in Finland. Now, it appears it has regained its leading position. It is now headed by Juha Sipilä, a first-term MP from the northern city of Oulu, with a background as CEO of several IT companies. Sipilä’s hometown epitomises the changing fortunes of Finland’s economy: Oulu once boomed during the high days of Nokia and the pulp industry, when Sipilä made his fortune, but has suffered high unemployment since the recession. Most of all, this was a terrible night for the fiscally conservative National Coalition party, which has been in power since 2011. The National Coalition first governed under the leadership of Jyrki Katainen, who headed a broad six-party coalition that promised reform to the state’s pensions, healthcare and social support structures and tighter control on government spending (leading to numerous puns on the Prime Minister’s surname, which is similar to kätäinen, the Finnish word for “cash”). Two parties, the Left Alliance and the Greens, went on to leave the government, as did Katainen, who headed to Brussels to become a European Commissioner in 2014. His successor was Alexander Stubb, the former foreign minister. Educated in the US, Belgium and the UK, a prolific Tweeter and marathon enthusiastic, Stubb is a more international and charismatic figure than the Finnish electorate is probably used to. This never translated into broad appeal, and the consensus is that Stubb was better suited to the more social and public relations aspects of politics than the less-glamorous work of hammering out consensus on domestic issues. Sipilä has to some extent used the government’s failing on social spending reform to his advantage. In an interview with the Helsingin Sanomat, he took some responsibility for this on behalf of his party, noting that previous Centre Party-led governments also failed to act on this issue. Still, Sipilä acknowledges that social spending reform is a divisive issue, and now he has won the election, he will likely have to pilot reforms through other coalition partners. The goal, he told the Helsingin Sanomat, “is to do less but to get it done.” For Finland in 2015, this may appear the best anyone can hope for.